Cholesterol concerns are no reason to put down that bag of cashews. On the contrary, you should keep on snacking because cashews and other nuts have been shown to improve cholesterol levels. That's good news because high levels of low-density lipoprotein, the "bad" cholesterol, can create dangerous plaque buildup on your artery walls, increasing your risk of heart attack and stroke. Cashews are high in fat, which might make them seem like bad choices when you're watching cholesterol levels. But only saturated fats -- found in meat, butter, cheese and lard -- are associated high cholesterol levels. Most of the fats in cashews are the monounsaturated variety, which may help lower LDL cholesterol levels and reduce your risk of cardiovascular disease, according to the American Heart Association. Other nuts and seeds, as well as olive oil and avocados, area also rich in monounsaturated fats. 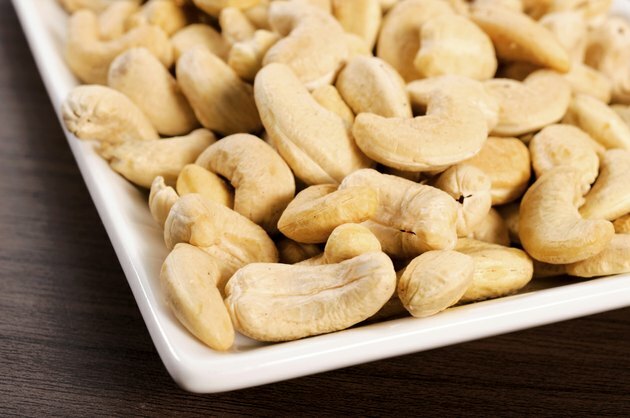 Along with heart-friendly fats, cashews and other nuts are good sources of soluble fiber. Fiber is a type of carbohydrate that passes through your body undigested, and the soluble variety absorbs water to form a thick gel. This slows nutrient absorption and even prevents your body from absorbing some dietary cholesterol. As a result, adding more soluble fiber to your diet may decrease LDL cholesterol levels, helping to protect your heart. Other sources of soluble fiber include oat bran, beans, peas and barley. Multiple studies show nuts to have a healthy effect on cholesterol levels, as confirmed by an analysis of existing research published in the "British Journal of Nutrition" in 2006. Researchers found that a diet rich in tree nuts such as cashews reduced LDL cholesterol levels by 3 percent to 19 percent compared with traditional Western diets as well as low-fat diets. Study authors attributed this effect to fiber and antioxidant content, as well as the presence of plant sterols -- natural substances in plants that may block the absorption of cholesterol in the small intestine. Cashews may be healthy, but at 163 calories per ounce they can quickly lead to weight gain if you overindulge. Eating 3 ounces of these nuts, for example, will cost you 489 calories, nearly 25 percent of your needs in a 2,000-calorie diet. Eating more calories than you burn for energy leads to weight gain, and being overweight can increase your levels of LDL cholesterol. Therefore, stick with moderate portions of cashews to avoid undoing any benefit. How Are Cashews Good for You?